I've always enjoyed writing, and tackled my first rockhound book when I was still in college. Being a young rockhound with most of my collecting experience up to that time being for gem materials in Western Washington, and few trips to mineral localities, I was anxious to get out and explore. There was very limited time to get out and go collecting while in college (and of course there was the limited funds to pay for that 35¢ per gallon gasoline), so I turned to the literature. Fortunately, being a geology student, there was a fairly well stocked geological library at hand. After researching the geological publications on mines and geology in Washington to learn what was out there and had been recognized by other geologists and miners, I was even more anxious to go explore on my own. When I was able, I managed some collecting trips, but mostly that had to wait until after graduation from Washington State University with a Masters Degree in Economic Geology. After college, field trips, information from friends and continued literature searches resulted in a lot of knowledge. As time went on, I transferred some of this knowledge to words on paper and wrote books for others who were interested in rockhounding and mineral collecting activities. Below are the two books currently available. 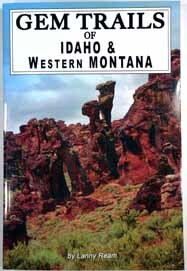 A guide to Idaho and Western Montana is now available, reprinted in 2017. This Gem Trails Guide has 55 localities in Idaho and 44 in Western Montana with a map and GPS coordinates for each location. Copies are available from Gem Guides Book Co., or from your favorite gem and mineral book source, or any book dealer, 256 pages, $14.95 (request ISBN 978-1-889786-51-3). The 2nd edition is 370 pages and has 360 color photographs. There also are 22 black and white crystal drawings and four maps. The 2nd edition is expanded from the first edition (revised and updated) with the same format with three major descriptive chapters in the first section covering the Coeur d'Alene Mining District, Blackbird Mining District and the Sawtooth Mountains, three of Idahos most famous localities. The second section is an alphabetical listing and description of the minerals. Most of these descriptions include locality information, description of the minerals, associated minerals and their occurrence. There are 39 new mineral descriptions; minerals new to the state that have been discovered since the first edition. In addition, there are many new occurrences of the minerals described in the first edition. There also is a new expanded index, with all minerals and localities to aid in your finding that certain locality. 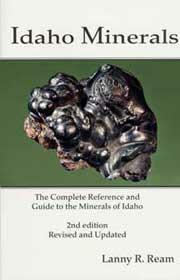 Idaho Minerals, 2nd edition is only $27.95, ISBN 0-9723356-3-3.